Imagine No Malaria, the only faith-based organization represented among the award recipients, was recognized for its grassroots efforts in reaching rural and hard to reach areas with its prevention methods. Dr. Olusimbo Ige, executive director, Global Health for the General Board of Global Ministries was on hand to receive the award, which was signified by the bestowing of a red “superhero” cape. Drake Zimmerman, vice chair of the Rotarians Action Group on Malaria, made the presentation. “Rotarians Action Group on Malaria and all of Alliance for Malaria Prevention recognize the unique contributions of The United Methodist Church to malaria control, which is why we singled out The United Methodist Church’s Imagine No Malaria initiative as the only faith-based effort we honor this year,” Zimmerman said. “The award honors the size, breadth and ongoing dedication of The United Methodist Church’s work, in which thousands upon thousands have donated, resulting in thousands of children being alive today, thriving today, in many countries! The contributions of United Methodists from across the globe, especially in the U.S. and Canada, means tens of millions of people now live healthier and more prosperous lives. 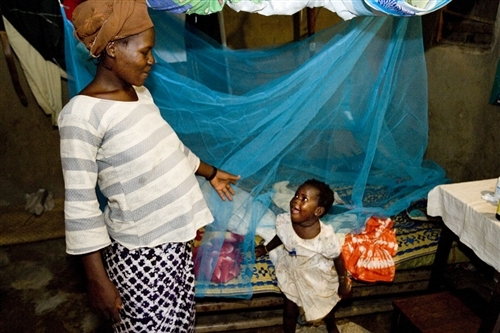 The Alliance for Malaria Prevention, with more than 40 partners, is a coalition of government, nonprofit, private sector, humanitarian and faith-based agencies working for malaria control. Imagine No Malaria is committed to ending death and suffering from malaria through prevention, communication, trained health workers and facilities, and grassroots education. To date, INM has raised 86 percent of its goal with more than $65 million in gifts and pledges. United Methodists across the world are working hard to reach and celebrate the initiative’s $75 million goal before the denomination’s General Conference in 2016. Bishop Thomas J. Bickerton of the Pittsburgh Area leads the Imagine No Malaria campaign.